A global manufacturer of custom colored acrylonitrile butadiene styrene thermoplastic sheets sought to replace its existing process of manually applying paper labels to its products. They wanted to offer customer-specific branding, mark production traceability codes (lot and date) and direction of travel arrow. The labels were both labor-intensive to apply and prone to delamination due to the heat involved in the manufacture of the thermoplastic sheets. Further, they wanted to eliminate the ongoing materials costs associated with purchasing the labels and disposing of their waste paper backing. For those reasons, the company sought an in-line, dual-sided laser marking and coding solution that could be implemented across—and manage—all six of its facility’s production lines, running at speeds of 25 feet (7.62 meters) per minute. It was also critical to preserve the existing programmable logic controller (PLC)-based production keystrokes and customer-specific messaging information in the transition. After a two-week demo, Matthews implemented the e-SolarMark+ CO2 laser marking system with 30-watt laser output. Two units, placed at the web-edge of each of the six production lines, mark customer-specific branding and traceability codes in line as each new job begins. The total package is controlled by MPERIA®, Matthews’ marking and coding automation platform. MPERIA® drives the lasers and communicates production data to and from the customer’s existing PLC-based human-machine interface (HMI). The HMI was reprogrammed on-site to include a new print preview and confirm step. This eliminated the need for new controllers and allows each laser mark code to be verified and approved by the line operator as jobs change. 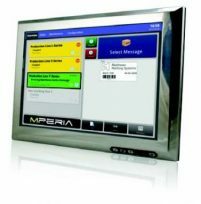 With MPERIA®, operators’ inputs are automatically transmitted to populate variable data fields in the existing laser message template, reducing errors when creating message content. Further, MPERIA® serves as the central message management platform for all six production lines in the facility, allowing the facility to drive all printing devices from a single interface, and remotely manage message changes per order. With the new Matthews MPERIA®-driven laser marking system, the manufacturer saved an annual expense of $65,000 in material costs. The Matthews Marking laser provided branding solutions for their customers, creating new annual revenue of approximately $150,000. Additionally, the elimination of manual labor of applying labels, the manufacturer was able to reallocate their resources to other value-added activities within the facility, saving an extra $100,000. All of the savings combined contributed to a total ROI in less than 2 years.